Kestrel Aviation ManagementBoeing 787-8 BBJ. In July, China’s HNA Aviation Group will welcome a shiny new Boeing 787-8 Dreamliner to its fleet. This plane is special because it is the first 787 Dreamliner to be built purely as a private jet. HNA’s new Dreamliner is symbolic of a hot new trend in private and corporate aviation — long-range, mid-size, wide-body airliners. “It’s an emerging market that didn’t really exist in the past,” Kestrel Aviation Management CEO Stephen Vella told Business Insider. Kestrel oversaw the design, engineering, and fabrication of HNA’s new Dreamliner which has an estimated total cost topping $300 million. 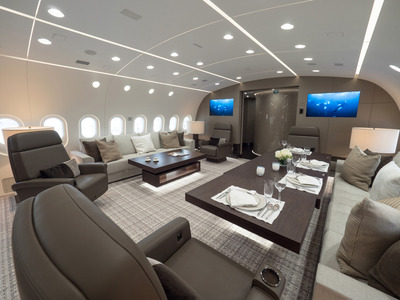 Airbus and Boeing have long offered versions of its airliners to private customers under their Airbus Corporate Jet and Boeing Business Jet programs. However, buyers of these airliner-based private jets have long gravitated to either four-engine, jumbo jets like the Boeing 747 or smaller, narrow-body jets such as the Airbus A320. Kestrel Aviation ManagementBoeing 787-8 BBJ interior. Although twin-engine, mid-size, wide-body jets such as the Boeing 767 and the Airbus A330 have long been available, they never quite caught on with the private jet crowd. However, in recently years, ultra high-end private jet customers have become increasingly interested in the new generation mid-size, wide-body planes such as the Dreamliner and Airbus A350. According to Vella, several factors led to the shift. First, leading business men and heads of state are generally pressed for time. As a result, they prefer be to able to fly anywhere they need to go non-stop. Until recently, this simply wasn’t possible in a twin-engined jet. The traditional thinking in the aviation dictates that there’s safety in the number of engines a plane has. Regulating bodies such as the US Federal Aviation Administration have even placed limits on which ultra-long-range intercontinental routes twin-engine jets can fly. As a result, government and corporate clients looking for a plane which the range and capability to go anywhere in the world had to turn to four-engined jumbos. However, with the incredible reliability of modern turbofan engines, the regulatory limitations on twin-engined jets have essentially been wiped out. Now, planes such as the A350 and the 787 can fly anywhere the owner requires, but in a slightly smaller and more affordable package. For instance, HNA’s new state-of-the-art composite Boeing has a range of 9,800 miles even when packed with passengers, luggage, and fuel. A similarly outfitted A350 ACJ will be able to delivery that type performance as well. “You can fly between virtually any two points on the globe,” Vella said of the Dreamliner. Secondly, the price of crude oil has fallen dramatically over the past two years. Even though cheaper fuel makes buying and operating a thirsty, four-engined, jumbo jet much more attractive, low crude prices have also cut dramatically into the income of Middle Eastern governments. Unfortunately for the 747 BBJ, they are also some of the plane’s biggest customers. According to Vella, all major Middle Eastern governments such as Saudi Arabia, operate large royal fleets, many of which are jumbo jets, for elite members of the ruling family and officials to use. Over the next decade or so, these fleets with need to be updated. Vella, whose company has bought and sold more than $50 billion worth of commercial and private jets, believes the Middle Eastern clientele are ready to do some belt-tightening and downsize to smaller planes. Finally, another factor that has benefited the Dreamliner-sized jet is the increasing public sensitivity towards political largess. Unlike the US, where the plane that operates as Air Force One is held in high esteem and seen as a symbol of national power, the public in many countries view a large presidential aircraft as a sign of political over indulgence. According to Vella, this is a particularly sensitive issue in Europe. However, a smaller aircraft with the performance capabilities of a jumbo, but in a less attention-getting package is a reasonable alternative. 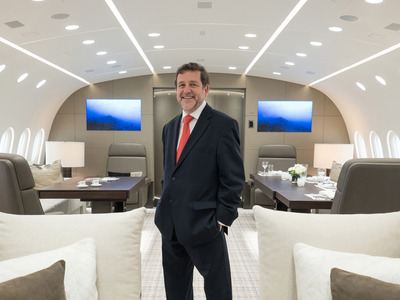 Kestrel Aviation ManagementKestrel CEO Stephen Vella inside the Boeing 787-8 BBJ. After all, it’s hard to arrive discretely in a jumbo jet no matter where you go. Even at the world’s busiest international airports, an aircraft the size of a 747 or Airbus A380 is conspicuous. But all of this requires some perspective. Even the “smaller” 787 BBJ is still an absolutely massive aircraft. At 186 ft. long, even Donald Trump’s converted Boeing 757 is dwarfed by the new Dreamliner. And with 2,400 sq. ft. of living space, it offers the same amount of room as an average American suburban home. 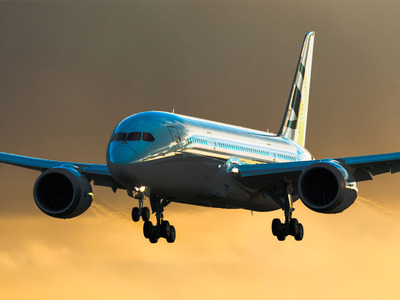 According to the long-time aviation executive, over the next 15-20 years, demand from just the Middle East for Boeing 787-sized private jets will top 30 aircraft. That may not sound like many planes, but at more than $300 million a pop, that’s about $10 billion in business from just a handful of customers. In fact, Vella believes demand from East Asia will be just as intense over that period of time. “Because of the high number of long distance and (trans-oceanic) flights the customers make, these are the perfect planes for Asia,” Vella added. Whether the market for these mid-size, twin-engine wide-body private jets actually skyrockets remain to be seen. But with the unprecedented level of advanced technology, luxury, and performance it can offer, they are an undeniably attractive option for the right buyer.